The following article appeared in the "The Age" newspaper in Victoria, Australia. OH, THAT Judith Durham voice. So honey-pure you could spread it on toast - but there are many reasons why she may never have sung at all. She had asthma when born in July 1943 at Essendon's Llandyssil private hospital and, at age four, she caught the measles, which left her with a life-long lung complaint called bronchiectasis. During later childhood years in Tasmania, Durham was taken to hospital to have her adenoids and tonsils removed, a precautionary operation averted only when doctors, concerned at a polio epidemic, sent her home. In the 1960s, as the 22-year-old lead singer of the Seekers, Durham had nasal polyps on a tour of England - and after a car accident on the Calder Highway in May 1990, she awoke from surgery to find her voice temporarily gone because of the tubes that had been put down her throat. So many body blows - yet here is that unmistakable bell-like voice, quietly giving me a world-premiere performance of one of her own songs at a table in a St Kilda restaurant. Well, not quite premiere: she says she sang a few bars to Rolf Harris while he was in Australia recently. ''I had always worried that the tune was one of Rolf's,'' she says. It wasn't. 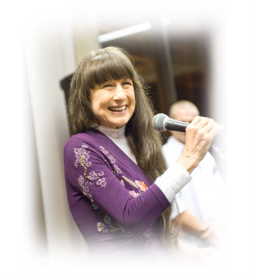 It is many years since the Seekers conquered the world of music, and Durham is now a well-established solo performer and composer, scheduled this year to record a CD of songs she wrote about each Australian capital city. But she is here now to talk about another personal body blow, the death from motor neurone disease (MND) of her husband, pianist Ron Edgeworth, and the frustrating shortage of money that still hampers the search for a cure 16 years later.